Every time we go to France I notice the growth in cycle routes and cycle touring facilities. Gone are the days when the only technique, which was a good one, for the cycle tourist was to follow the white roads on the Michelin maps. 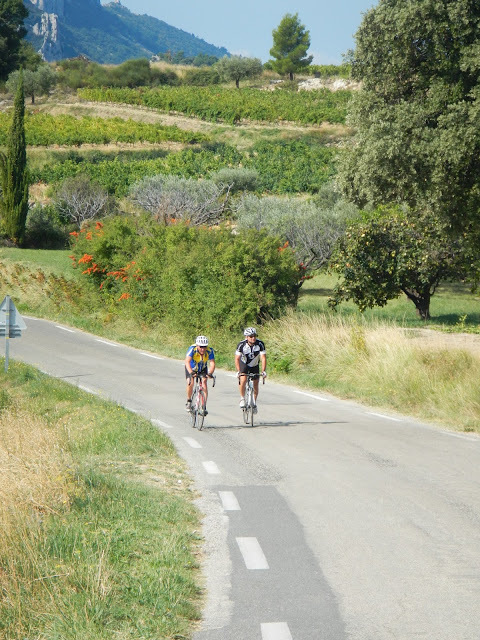 It still is a good way for cyclists to get about, because France is a big largely empty country, but these days there are many cycle circuits and signposted long distance routes available to the cyclist. and because we were visiting non-cycling friends, we decided not to bother shocking the Lycra®-clad and spent our time travelling about the area, eating large meals, etc. The kind of thing many of us do in France. As conscientious bloggers we investigated the cycling possibilities of the area in various tourist offices and found piles of pamphlets describing circuits on the south side of Mont Ventoux. These are available in digital form on the Provence Cycling website: (http://www.provence-cycling.co.uk).